The Isle Airtech 10’ Inflatable SUP has consistently ranked a very close second place to Tower’s Adventurer 9’10”, and by our analysis, it’s giving that board a very good run for its money! There are a handful of small (but important) differences which you should consider before deciding which board you’d like. If you’ve also been looking at the Tower Adventurer 9’10” Inflatable, this is a very good alternative to consider. The Isle Airtech 10’ board is slightly lighter, but a couple inches longer and 4 inches wider than the Adventurer — the lighter weight means it’ll cut through the water a little more quickly, but the added dimensions keep it stable and comfortable to ride. 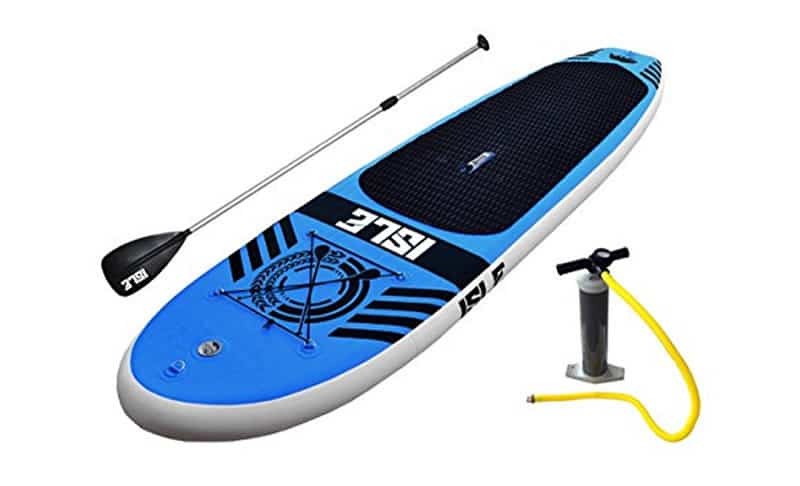 This board comes with basically the same great package (fins, paddle, and pump), but also includes a carrying bag and a built-in carry handle on the center of the board, which the Adventurer does not. We also think this board is a bit prettier — but you can decide for yourself on that one. As with so many of these impressive inflatable SUPs, it’s pretty hard to differentiate the Isle Airtech from a rigid board once it’s inflated. By opting for the convenience of an inflatable, you’re really not making any compromise on looks or functionality. This board comes with a great package of all the essentials (paddle, leash, fins, hand pump) and a few bonus features (carry bag, built-in carry handle, tie-down bungee on the deck). It’s also, as advertised by Isle, “30% lighter than comparable inflatable paddle boards,” due to special stitching and sealing methods and higher-density PVC. 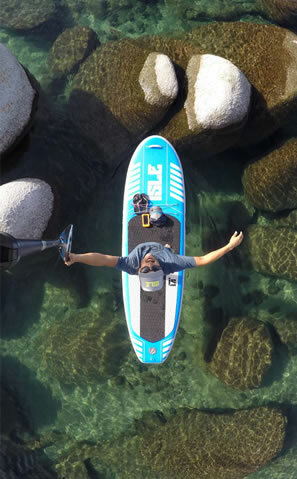 This makes for a board that’s lighter to carry and lighter in the water. The lightness in the water could be a potential negative, but we believe this is nicely balanced with the uniquely wide dimensions of the board (4 inches wider than Tower’s Adventurer 9’10”, for example). Rolls Up into a sleeping bag size for easy storage. 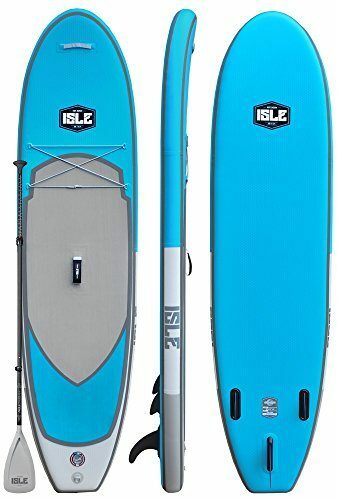 Isle advertises this board as great for flatwater, river runs and small waves. Includes a 3 piece adjustable aluminum paddle and high-pressure hand pump. Built-in carry handle that recesses into the deck while riding. 3 fins: “2 plus 1” fin system, with removable center fin. Deck mounted bungee system and 4 stainless steel D-rings for carrying gear on board. Diamond groove traction on the deck. Includes a very nice travel bag. 2 year manufacturer’s warranty — comparable to Tower’s warranty. 30 day “Ride it and love it” guarantee. Size: Deflated Dimensions: 1ft in diameter x 36 inches wide (about the size of a rolled sleeping bag); Inflated Dimensions: 10′ x 31″ x 6″. Material: Super durable PVC material, extra light compared to other inflatables. Inflating: Inflates to 15 PSI, rideable at 10 PSI depending on rider’s weight. Set up: Pumping takes about five minutes. Then you’re ready to go! The “2 plus 1” fin setup allows you to remove the center fin and just use the 2 outer fins (not removable) if you want tighter maneuverability. The Ride: The Adventurer has a great, smooth ride! It’s pretty wide and relatively short compared to some other boards, but we found it to be a really good balance. More experienced riders looking for a speedy board should know that this thing is not going to cut through the water — but it’s super sturdy and comfortable, and the short length keeps it maneuverable to make for a very fun ride. It’s hard to make a shorter board like this without compromising on balance, but Tower has done a very impressive job. You get the easy maneuverability of a shorter board, but the generous 6” thickness means there’s no compromise on stability. As stated, this is one of the points to pay attention to when deciding between this board and other top inflatable boards such as the Tower Adventurer 9’10”. With the Isle Aristech 10’ you’re getting a slightly lighter board — this means easier carrying and quicker maneuvering in the water. It also means it could move around more in the water, but this is balanced out by the extra 4” of width. The ride is perfect for beginning and intermediate paddlers looking for a sturdy board that’s easy to handle. The tie-down bungee on the front of the board is very useful for attaching gear. Includes a good-looking carry bag (Tower Adventurer does not). Nicely-build carry handle at the center of the board that stows into the board when riding. The 200-240 pound weight limit could be a negative for bigger riders, or if you’re planning on bringing a partner or a dog. Some complain about the heaviness of the paddle. The extra width on this board could be a negative — it can feel a little clunkier in the water. Price: 100% – Right on par with the standard-setting Tower Adventurer 9’10”, but boasting a bonus carry bag. Material: 100% – Great, lightweight PVC, solid diamond-groove deck grip, and useful bungee system and D-rings. Design: 90% – Looks-wise, this board is a winner in our opinion. Functionally, it is also very solidly constructed, and is packed with all the on-board features you could want for easy carrying and gear-attachment. The one potential negative we see here is the light weight and extra width — for many riders these will be positives, but more serious riders might find the board clunky and a bit slow in the water. Overall: 96% – Great looks, solid construction, a highly competitive package of features. If you’re torn between the Isle Aristech 10’ vs. the Tower Adventurer 9’10”, don’t worry — we are positive you’ll be more than pleased with either. Before buying either board, though, we recommend you take a look at our reviews of both, weigh the minor differences in pros and cons on each one, and decide which is right for you. Again, the Tower Adventurer 9’10” offers more “standard” dimensions and perhaps a slightly more solid-feeling ride. The Isle Aristech 10’, on the other hand, offers better looks, lighter weight, and a great carry bag. If you think you’re ready to buy this board, head over to the Isle Airtech 10’ page on Amazon to check out the customer reviews and get your free shipping. Have you tried the Isle Airtech 10′? What are your thoughts on it? Talk to us about how you like it in the comment section below. The Isle Airtech 10’ Inflatable SUP is consistently ranked a very close second place to Tower’s Adventurer 9’10”, and by our analysis, it’s giving that board a very good run for its money!